However, one that I have finally completed, as you may have guessed, has to do with my slightly cryptic Something Wicked-Awesome, This way Comes post. If spinning hot air is a common method of roasting coffee, then why could you not use a Hot air popcorn popper? Being somewhat familiar with popcorn mechanics, I assumed that the element would provide enough heat. I mean it's hot enough to transform the water in the popcorn into steam thus producing that satisfying "POP" sound and providing light and fluffy kernels that are much more palatable than their un-popped counterparts. But would the fan be strong enough to move the coffee beans around the chamber properly to provide an even roast? Or worse than uneven roasting, would the beans sit there and burn? Yikes! These were all questions that I took to the Oracle? (The Internet) So I began to read and read and read.... And then a bunch of life altering stuff happened and experimentation was halted. So now it is 10 months later, and I have a functioning Hot air popper of the proper design and here we go!!!!! I chose to start with my favorite - Guatamalan Huehuetenango (from further north than Antigua) The Chiapas and Huehuetenango are similar coffees as they are geographically close, however the Huehuetenango (way-way-teh-nawn-go) has a little more body than the Chiapas - A peppery aroma; almost smoky that blends well with the savory spiciness. Very mild in acidity. Hinting at Chocolate and Caramel. THIS is my cup of standard "Joe"; Sadly, most pre-roasted Huehuetenango is on the lighter side... Just like Antigua... But I like mine just shy of "Full city" (medium dark). I hear a questions forming.... "Do you have to roast all 4 lbs of that coffee?" and "How are you gonna drink that much coffee before it becomes stale?" Well as to the first one.... Nope, unlike roasted coffee, green coffee will store, without issue, at room temperature for a year; where as roasted coffee goes stale in about 1 week. Pretty wicked awesome huh? You are going to need 4 more things to produce your own home roasted coffee. Though the last one is optional (dependent on weather) You need a large stainless bowl to catch the chaff, a wooden spoon, for stirring at the beginning, and a colander of some type, preferably mesh, to shake your beans while they cool. 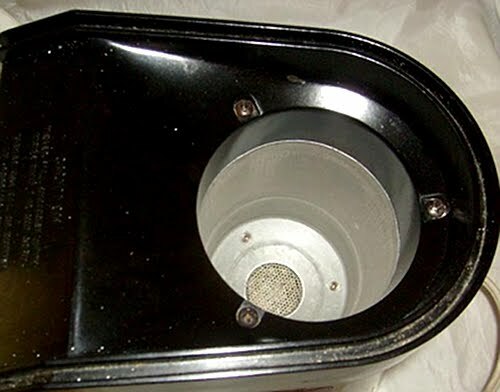 Now IF the weather outside is cold and wet, you will need a box that is big enough to hold the bowl and the popper; this will protect the popper from the outside chill. Your clothes will inevitably smell like the chaff after your done. Yeah, it's a somewhat smelly job, but your persistence will be rewarded beyond your wildest dreams. Plan ahead, cause your coffee, as good as it will smell, once it's away from the toasted chaff, it will have to "Gas-Off" for 24 - 48 hours. I don't like this term, so I will now refer to it as "ripening". Go ahead and set up your popper and chaff bowl in the box, making sure that your wooden spoon is handy. Turn the popper on, and wait about 30 - 45 seconds for it to warm up before pouring your green coffee into the cylinder. Let them kind of hang out for about 30 seconds, just kind of spinnin' round and round. After about 3-5 minutes you will hear a popping sound, though to me it sounds more like a "tink" (kind of like the sound little tiny pebbles make against the glass of a second story window, being thrown by a love sick teenage boy in his parachute pants at 1:30 am) eh, hem... Never mind. This sound is called "First Crack" and is about where "City Roast" occurs, being a medium roast. When you have achieved your favorite roasting stage (OK, I tried timing it, but I did 5 batches of coffee and all the times were very different.... So sadly, all I can do is explain the process as best I can) Turn off the popper and quickly dump the beans into your mesh colander. In an effort to cool them down as quickly as possible..... This will minimize the further roasting that occurs from the heat "Carry Over". Yes my friends, breathe new life into that old Hot Air Popper, never purchase stale coffee beans from the store or your local coffee shop, again! POWER TO THE PEOPLE! For more information on roasting your own coffee beans in an Air Popper, check out Sweet Maria's. I have already made 1 modification thanks to my brother's experiments... (we were both having a blast trying this out) I have covered the inside of the lid with aluminum foil to reflect heat back into the popper. There are a few modifications I will be making to my popper in the near future... by installing a thermometer so I can judge a little easier by watching the temperature of the beans. YEAH!! You have your popcorn maker! And I'm sitting here cracking up over the name of that one place...Mr Green Beans! LMAO!! Sooo....where's my cup? This is my favourite post yet, you sure do love your coffee! You are right about the smell of roasting coffee, just another of those, "so who bothered to taste this after they'd done it" things. I am very jealous of the choice of Coffee you have available to you too you lucky man. You are definitely cool beans in my book. Well done.